Parties have very different approaches for the May 26 European Parliament elections that will largely determine their results. Experts consulted by Postimees believe the Reform Party is looking at three seats, the Conservative People’s Party (EKRE) at two and the Center Party one seat. Should the UK not take part in EP elections because of Brexit, Estonia’s seventh seat would go to either Isamaa or the Social Democratic Party (SDE). European Parliament elections are all about persons. The entire country forms a single electoral district and those going to Brussels will be determined based on an open list, meaning that candidates with the most votes win. This also means that where a candidate is on their party’s list is of no official significance, even though it might carry symbolic meaning for the voter. The first mandate for a party requires its candidates to get 10-15 percent of all votes. From there, the electoral system will begin to have an effect, giving winners a slight edge. With the exception of SDE, parties that will meet elections with full lists of nine candidates have already registered them, and some conclusions can be drawn. Isamaa has been the most visible in its campaign so far as posters depicting their candidates can be seen all over. 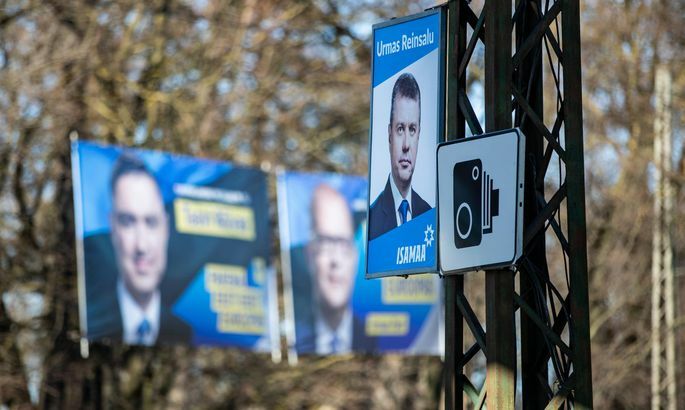 The design of the posters is rather similar to those of Riigikogu elections. Former Defense Forces commander Riho Terras as the party’s frontrunner is followed by Minister of Defense Jüri Luik and MP Viktoria Ladõnskaja-Kubits, both of whom have been critical of Isamaa forming a government with EKRE. Considering that the party is likely looking at a single seat in the European Parliament, placement on the list is hardly a good bargaining chip in terms of garnering support for the coalition in the Riigikogu. Since Riho Terras has not been included in any polls, his potential for votes remains unclear. The Reform Party has also launched its campaign that is largely paid for candidates themselves. The party’s top three for the EP elections is made up of Andrus Ansip, Taavi Rõivas and Urmas Paet who will very likely all succeed. Their result will, to a modest degree, depend on the first days of the new coalition between Center, EKRE and Isamaa. If the new government can send positive signals in the month it has before EP elections, protest votes currently favoring the Reform Party might be reduced, at worst robbing them of their third seat. EKRE voters are in their element as their party is looking at a place in the government after what was a stellar Riigikogu elections result for the national conservatives. This also means EKRE is poised to take at least one seat in the European Parliament. Mart and Martin Helme and Henn Põlluaas, who make up the top three of EKRE’s election list, will likely not be going to Brussels as the former two are looking at ministerial positions, with Põlluaas almost certain to become the next chairman of the Riigikogu. The party’s EP seat might go to Jaak Madison instead as it has been suggested no portfolio is coming his way. Madison needs to take fourth place in the election to work in Brussels and Strasbourg in the future. The campaign of the Center Party is expected to be next to imperceptible this time around as the previous elections depleted the party’s coffers and its candidates will have to rely on their own devices. Center’s list is built around MEP Yana Toom who will likely be reelected, even though she will probably not manage to repeat her previous vote yield of over 25,000. Center’s hopes for a second seat have been eroded by support for the party going into freefall since elections. The ruling party has lost the most ground among Russian-speakers who are expected to deliver Toom’s result. The Center Party is left hoping the first month of the new government will reverse their fortunes in the polls. SDE might succeed in taking a seat away from Isamaa and has a very strong list with which to achieve that. The party’s top three – Marina Kaljurand, Ivari Padar and Sven Mikser – are all strong and well-known politicians. The question remains whether SDE’s rating of just 10 percent might stop Kaljurand from performing well. Indrek Tarand will not be repeating his success as an independent candidate as evidenced by his rather modest Riigikogu elections result. What about wildcards? First, there is Estonia 200 and the Richness of Life Party. While neither is likely to take a seat in Brussels, they may bite into the vote yields of others. It is also probable that former first lady Evelin Ilves will take quite a few votes running for the Estonian Greens. Center might also be hurt by their former leader Edgar Savisaar who has hinted at the possibility of running and has potential to further reduce Center’s Russian voter base.